Fran’s approached us with a challenge : all of their content was hosted on a proprietary content management system and they wanted to migrate to WordPress with a brand new ground up designed website. Fran’s restaurant has been a Toronto institution since 1940, and we took the challenge very seriously. We wanted to include a beautiful illustration of their flagship location (Yonge / College) as the first captivating image that visitors see when they arrive at the site. We kept the site simple, clean and easy to navigate. The client was very pleased with the result and is excited to leverage the website in future marketing efforts. 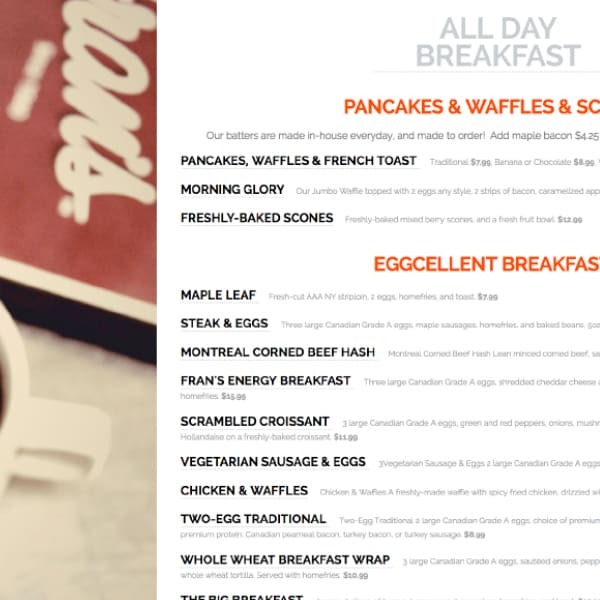 With Fran’s, we wanted to integrate a state-of-the-art and easy to read menu without going the same route as most other restaurants by using the same old jQuery modal technology to “expand” an image or even worse, an embedded PDF. We wanted to leverage WordPress’ inherent ability to manage and edit content easily and present it in such a way as to make it easy for someone to read the menu online in a mobile/tablet friendly way. As a result of these challenges we implemented a custom full screen “flyout” menu system that is fully responsive. The client loved how easy it was to read the menu and allowed them to integrate their breakfast/brunch, lunch and dinner menus seamlessly.